Specifically, this is about table III-IV. I have downloaded the average return data that one can obtain, in the HML and SMB setting. This means, I have the "Small", "Medium" and "Big" firms (size) average monthly returns since 1926-2017, as well as the "Low", "Medium" and "High" average returns of the BE/ME size of the firms. [...] We form 9 portfolios (S/L, S/M, S/H, M/L, M/M, M/H, B/L, B/M and B/H) as the intersections of the three size and the three BE/ME groups. The 9 portfolios are each subdivided into three portfolios (Lh, Mh or Hh) using pre-formating HML slopes. These slopes are estimated with five years (three years minimum) of monthly returns ending in December of year t-1. I don't understand how I should construct these 9 portfolios, as well as the "pre-formation" HML slopes. I am aware that the slope of the HML is its own factor coefficient (such as beta, in the CAPM) but what does it mean in this context? [...] isolate variation in the HML risk loading that is independent of BE/ME. Collect book common equity (BE) and market valuation (ME) for stocks, excluding financial, transportation and public firms. ME is measured as the number of shares outstanding with the stock price at the end of December. BE is measured at the fiscal year ending. Calculate cross-sectional breakpoints (33% and 67% percentile) for size (ME) and book-to-market ratio (BE/ME). The size breakpoint for year $t$ is the median NYSE market equity at the end of June of year $t$. BE/ME for June of year $t$ is the book equity for the last fiscal year end in $t−1$ divided by ME for December of year $t−1$. Sort each stock independently by BE/ME and ME. This results in the mentioned nine portfolios. Calculate the value-weighted return for each portfolio from July of year $t$ to end of June in year $t+1$. where $R_i$ is the monthly value-weighted portfolio return, $R_f$ the risk-free rate of return, $R_M$ the market return, $SMB$ the return of the size-factor mimicking portfolio and equivalently $HML$ for the value-factor. The regression is run using monthly return data over the previous five years (minimum of three years), ending in December of year $t-1$, i.e. if you form the portfolios in end of June of year $y$, the regression uses data from January $y-5$ to December $t-1$. The regression results in estimates for the factor-loadings $b_i$, $s_i$ and $h_i$ (and the intercept $\alpha$). What follows is, that you split up all nine portfolios into three subsamples which results in a total of 27 portfolios. So for each of the 9 portfolios, you sort each stock within a portfolio by the variable $h_i$ from the above regression. Just look at the monoton increasing value for $h_i$ in Table 3, which are the breakpoints for sorting. For each of the 27 portfolios you finally have to calculate the value-weighted return. Daniel/Titman (1997) subdivide the 9 size / book-to-market portfolios into five portfolios by $h_i$ which results in a total of 45 portfolios. The problem is, that some of the 45 portfolios only contain a single or very few stocks, i.e. the "portfolio" is not diversified. Thats the reason for only subdividing into 3 further sorts. I am aware that the slope of the HML is its own factor coefficient (such as beta, in the CAPM) but what does it mean in this context? HML is measured as the difference between the return of a portfolio of high BE/ME stocks and the return of a portfolio of low BE/ME stocks constructed to be neutral with respect to size. The HML portfolio is generally based on the entire stock market, but your 9 size and book-to-market portfolios (for which you are running the above regression) are much smaller subsamples. The slope just measures the portfolio specific exposure towards the HML portfolio. As you can see on the values of $h_i$ (and the t-values), the portfolios are far from being "its own factor coefficient". Bali/Engle/Murray (2016), Empirical asset pricing: the cross section of stock returns, John Wiley & Sons, 1. ed. Not the answer you're looking for? Browse other questions tagged finance fama-french or ask your own question. 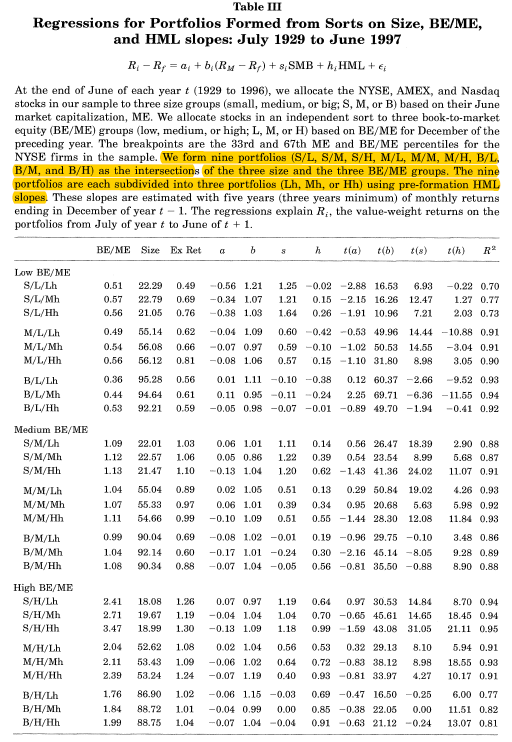 Are the Fama-French factor portfolios calculated based on absolute or relative value`?